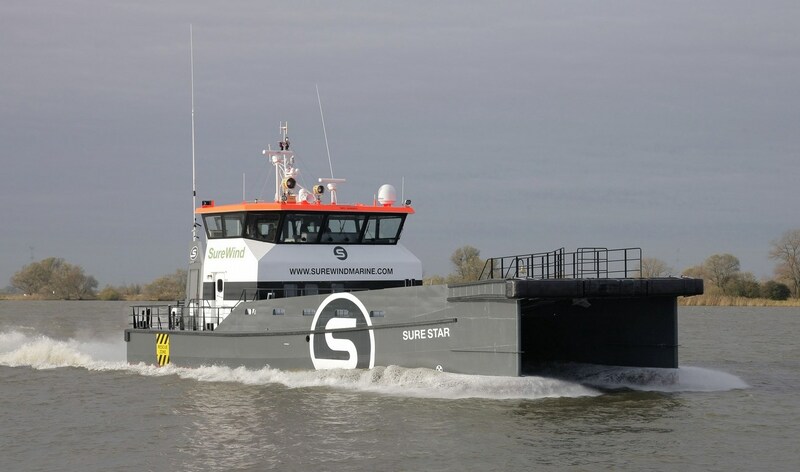 Home › Crew Supply Vessel › Fast Crew Supplier › Fast Crew Supplier 2610 › Fast Crew Supplier 2610 "Sure Star"
The first of two Damen FCS 2610s was handed over to UK company Sure Wind Marine on January 8, 2014, and named ‘Sure Star’. Sure Wind Marine, a specialist in the German offshore wind market, sent her to Esbjerg where she is deployed in the German wind farm fields. The second sister vessel, ‘Sure Swift’ was delivered the following month. This is the first time that Sure Wind Marine has ordered new build Damen vessels. However, Sure Wind also owns the first FCS 2610 ever built – the pioneering ‘Shamal’ - which was acquired in July 2013, whereupon it was renamed ‘Sure Shamal’.